Probably made for Thomas Beaufort, Earl of Dorset, Duke of Exeter and Admiral of the King's Fleet, this manuscript has a collection of laws, maritime ordinances, commentaries and other documents relating to the English admiralty of the 14th and 15th centuries. The documents were probably assembled during the reign of Edward III (1327-1377)and represent the authority on matters pertaining to the admiralty. This deluxe copy was probably decorated at a workshop in London by one of the most skilled artists of the day whose work is recognisable from several other surviving manuscripts. The type of handwriting in it is a legal hand seen in other official documents from London and Westminster. 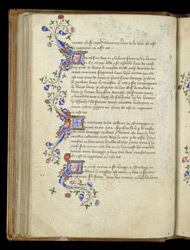 This page of maritime regulations does not have the luxurious border seen at other points in the manuscript, but the letters beginning paragraphs are decorated with the same type of leaf and flower forms which are skillfully shaded to appear to protrude and recede within and around the letters.